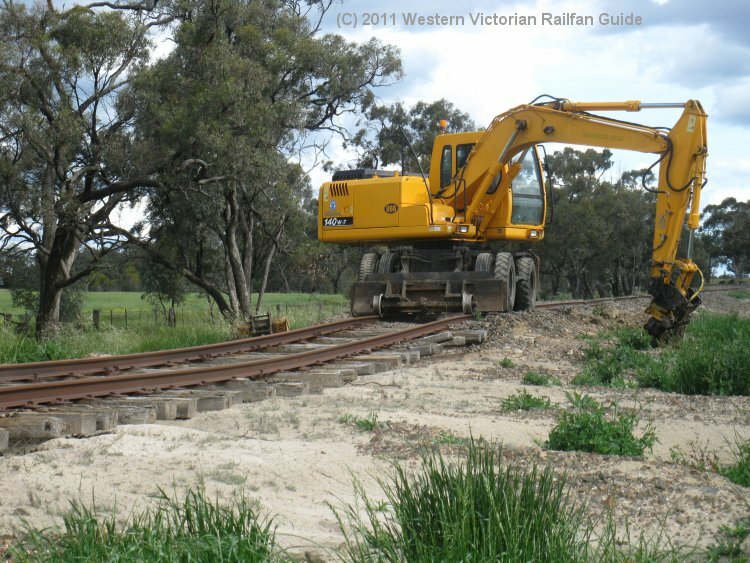 Below is a schematic representation of the Dimboola to Yaapeet railway line - which has been re-opened from Dimboola to Rainbow after the line was 'temporarily closed’ in late 2010. Some sidings have been disconnected from the main line. Any sections of track no longer in use are represented in grey. 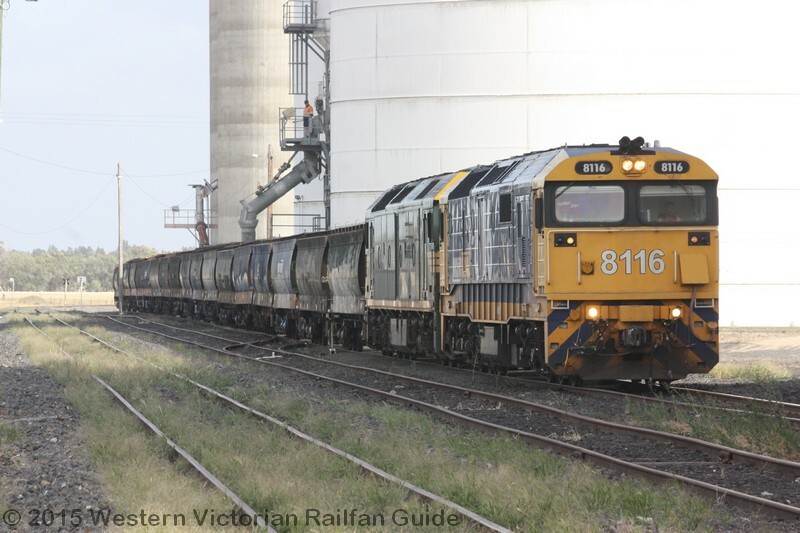 The first train to load at the new Bow Hill grain loading facility did so on the afternoon of Mon.28.9.2015 with locomotives G540 on the north end and BL33 on the south end of a rake of 19 hoppers. The site, which is located four kilometres north of Rainbow adjacent to the railway line to Yaapeet, is operated by GrainCorp and will replace their aging silo complex within the township. There is no run around loop at Bow Hill, so upon arrival at Rainbow a train's locomotives are remarshalled to have one on each end of the train before it continues out to be loaded. 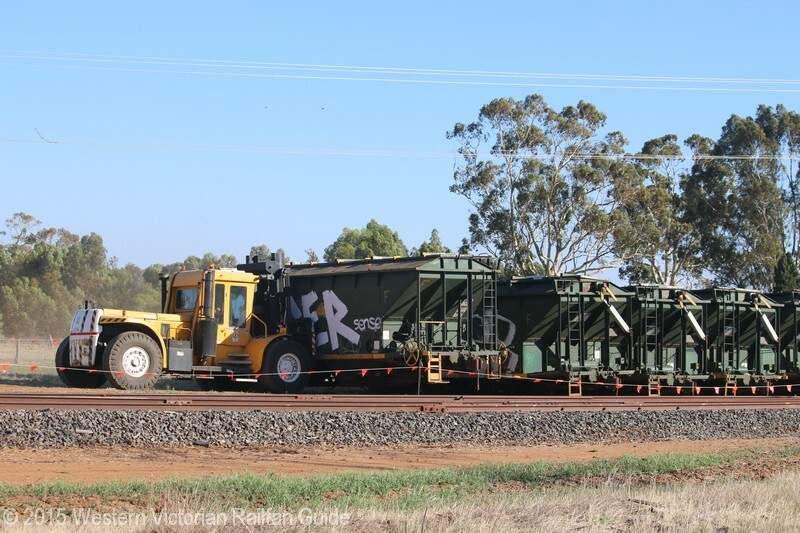 Grain will be stored in bunkers on the site and road trucks will be used to convey it to the rail loading facility which consists of a conveyor which feeds into a large hopper situated over the railway line that is used to load the grain into the rail hoppers. 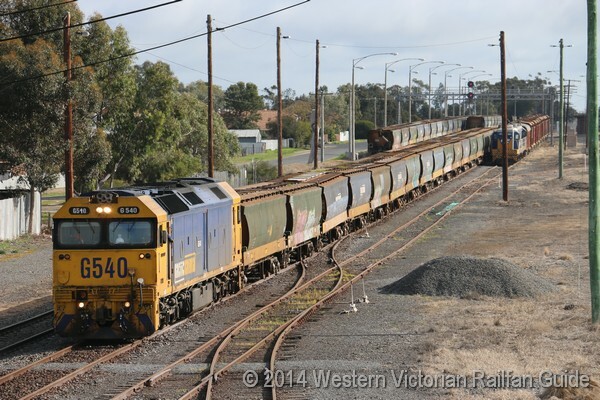 G540 ran light engine to Jeparit on the morning of Thurs.13.8.2015 to collect the rake of grain hoppers that had been stored there for a number of months. The train immediately returned to Dimboola where upon arrival the locomotive ran around the train and departed westward on the main line. 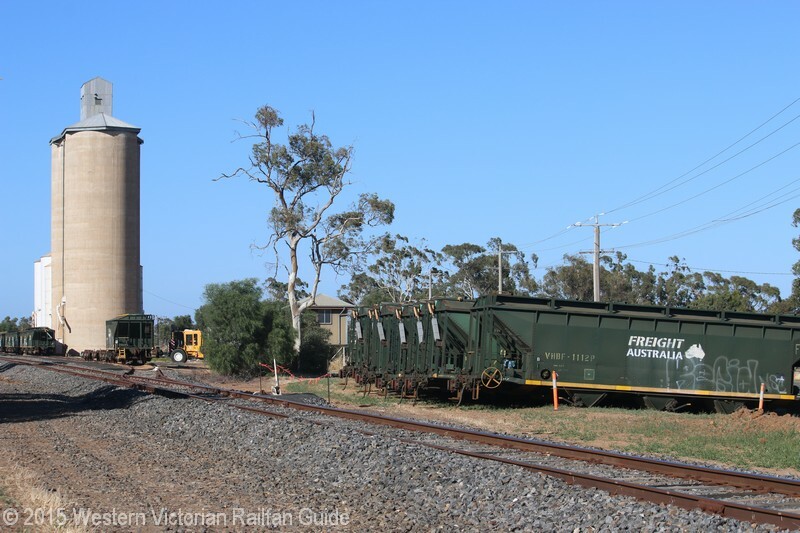 The train only travelled as far as the Dimboola GrainFlow Centre siding where it was propelled into the down end and stabled. A train was reported to be loading grain at Rainbow on Mon.17.8.2015 hauled by BL26 and BL27. Would this be the first occasion of double BLs on a train on this line? 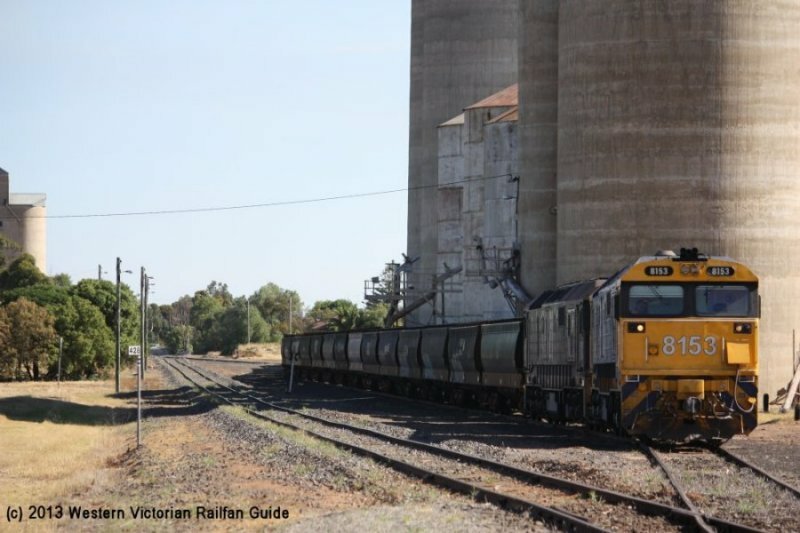 The second full week in January saw some intense action with multiple grain trains loading at Jeparit for the first time in over twelve months, but by the start of February the 38 hoppers had returned to storage in number two and three roads in the Jeparit yard and the grain loading action moved to another part of the system. On Sun.15.2 the stored hoppers were again removed from both Jeparit and Rainbow and a train loaded at Rainbow on each of the following two days. 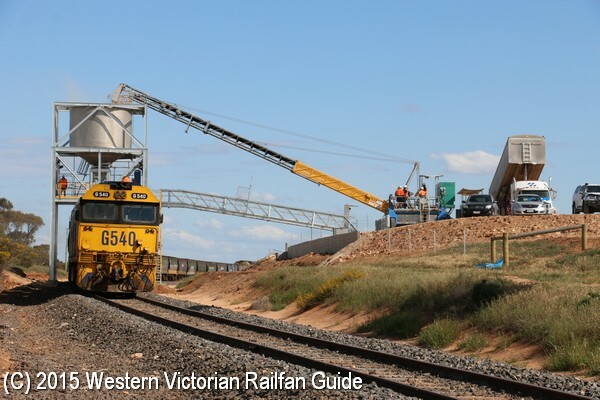 This year should also see further development of GrainCorp's Bow Hill storage site, just north of Rainbow, to bring to fruition their plans to use the adjacent 'booked out' Rainbow to Yaapeet section of the line to load trains from planned over-rail loading bins. These improvements will allow trains to be loaded quicker which in turn will lead to better utilization of the line. After a break of around two months, trains returned to the Rainbow branch in the second week of April when two trains were reported loeading at the terminus. 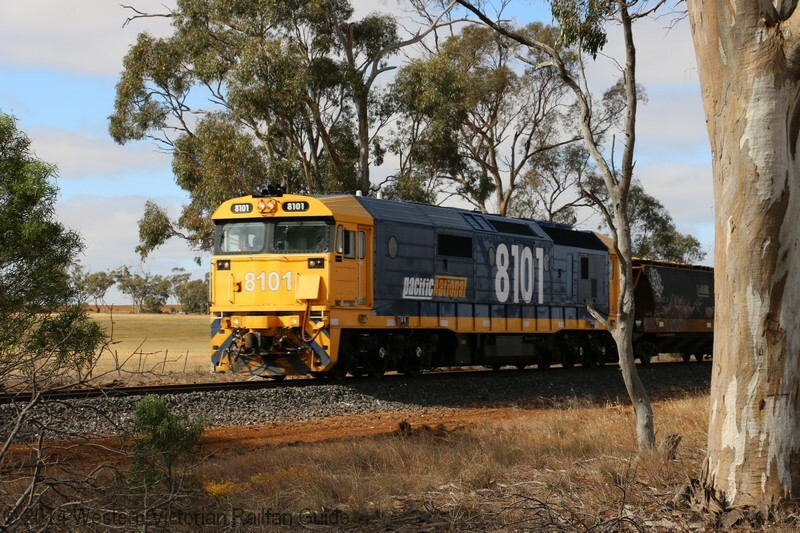 With harvest drawing to a close for most grain producers in the northern Wimmera, the first train observed since early November operated on this branch on Tues.18.12 hauled by XR559 and G528. 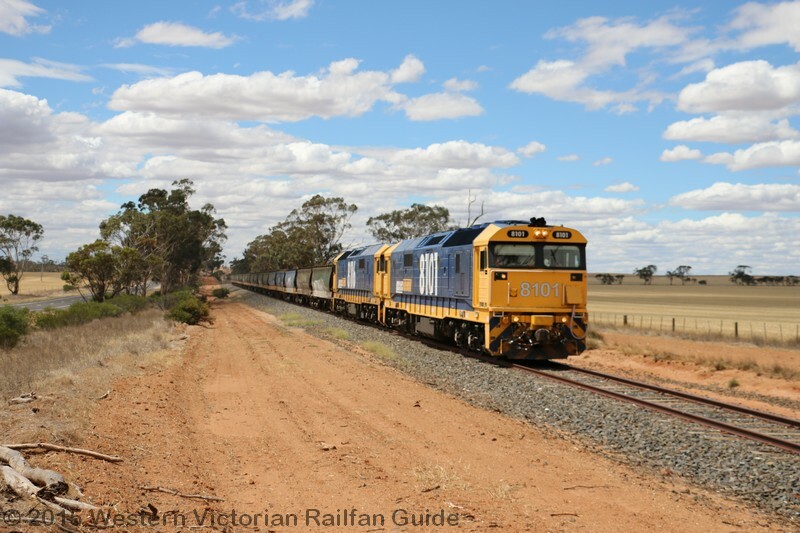 After its future being cast in doubt when the line was ‘temporarily closed’ and had baulks placed across it in December 2010 followed by severe flood damage in January 2011, the Yaapeet branch line has seen its first train in 15 months. Significant rehabilitation works in the last few months of 2011 has seen the flood damage repaired, sleepers replaced and level crossings upgraded which allowed G539 and XR558 to venture north from Dimboola before dawn on the morning of Sunday 19th of February with twenty VHGF type hoppers to be the first train on the line since late November 2010. 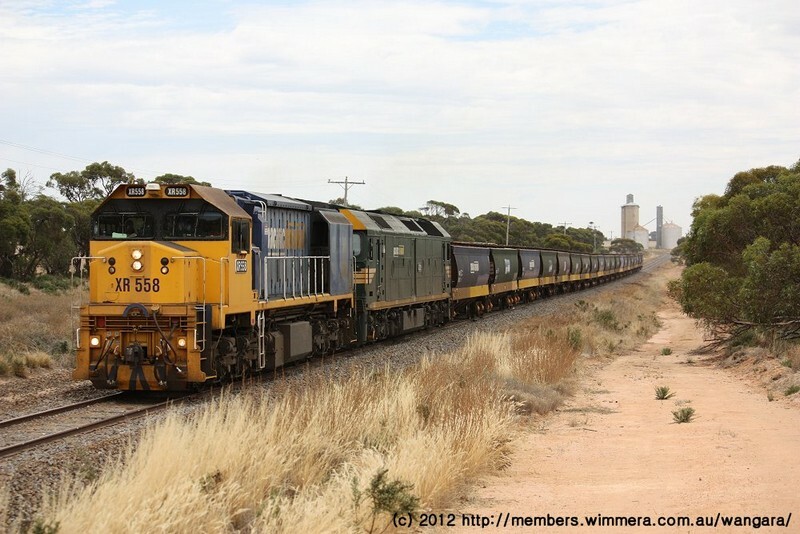 XR558 and G539 leading the first up loaded train on the branch north of Dimboola for 15 months, seen here soon after passing the silos at Pullut between Rainbow and Jeparit on the afternoon of Sunday the 19th of February 2012. It appears that the works on the Yaapeet line have finished, and we are just waiting for there to be a need for a train to run. As part of the upgrading works on this line, the sidings as Arkona, Tarranyurk, Ellam and Pullut have been disconnected from the main line. 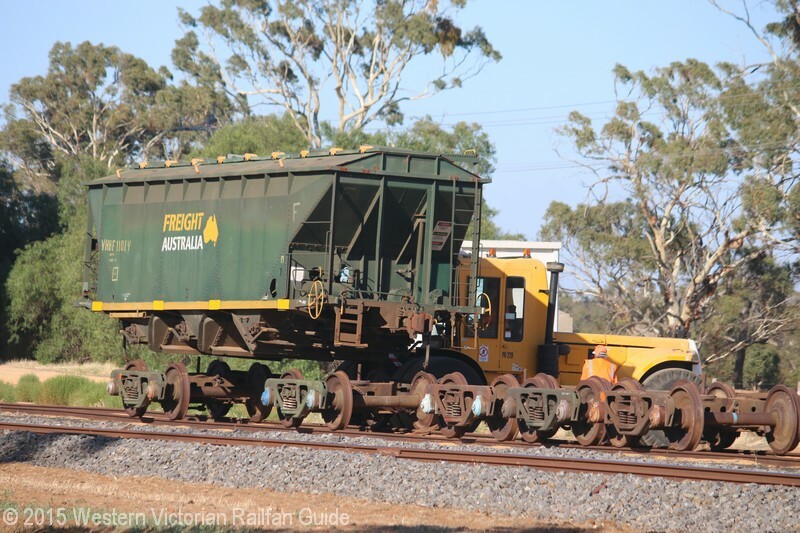 This leaves Jeparit and Rainbow as the only sidings on the line servicing an active GrainCorp stoage facility and the Antwerp siding that is currently being used to store a rake of VHBF grain hoppers. Work on the Yaapeet Line Repairs is well underway. Sidings at both Arkona and Tarranyurk have been disconnected and straight railed. The photo to the right shows repairs to the washaway south of Arkona. Work on repairing the flood damaged Yaapeet Line has commenced. 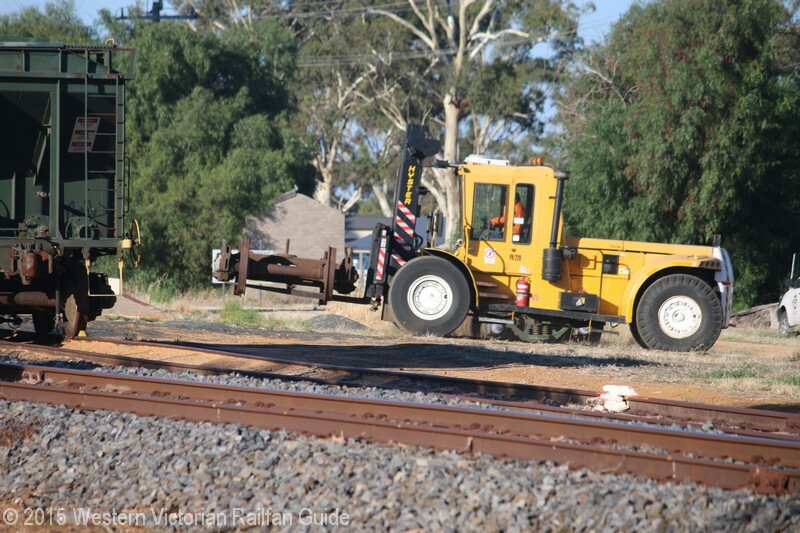 Track machines have been seen at Jeparit and Arkona. The photo to the right shows a track machine working on the damage south of Arkona. 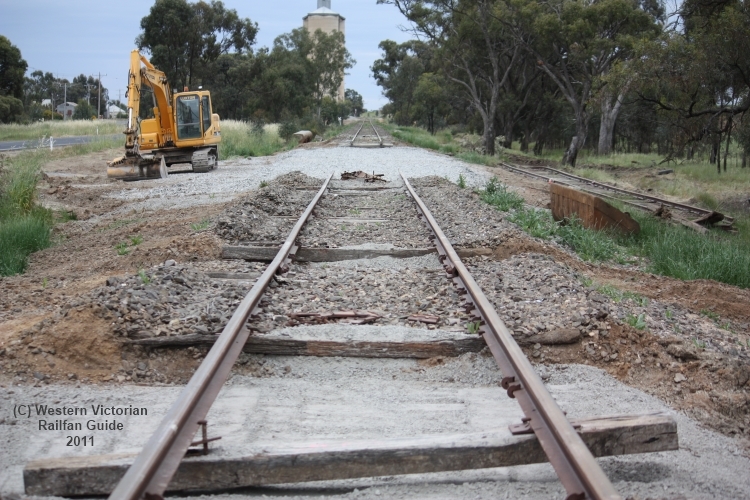 The Yaapeet Railway Line - which stretches between Dimboola and Yaapeet in Western Victoria, was damaged to an un-useable state, by floods in January 2011. 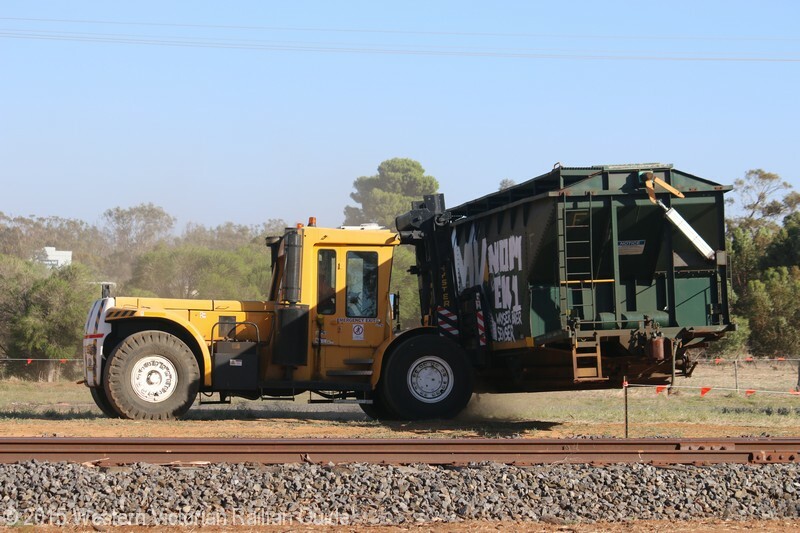 Terry Mulder, the Victorian Government's Minister for Public Transport, announced the government's $5.3 million contribution to the re-development project, which along with Graincorp's $1 million, will be used to repair the 66km stretch of line from Dimboola to Rainbow. More information about this announcement and the project are available at several online news sites. The Yaapeet Line near Ellam, after the January 2011 Floods. Heavy rain overnight on Tues.11.1 in the Jeparit area has resulted in a large quantity of water breaching the railway embankment and causing a significant washaway near the 407km post, between Jeparit and Ellam, on the Yaapeet line. There are also less spectacular wash aways near Arkona, north of Dimboola. The line was already booked out of service as of the 12th of December last year and with this damage it would appear that it will not be reopened to traffic in the near future. 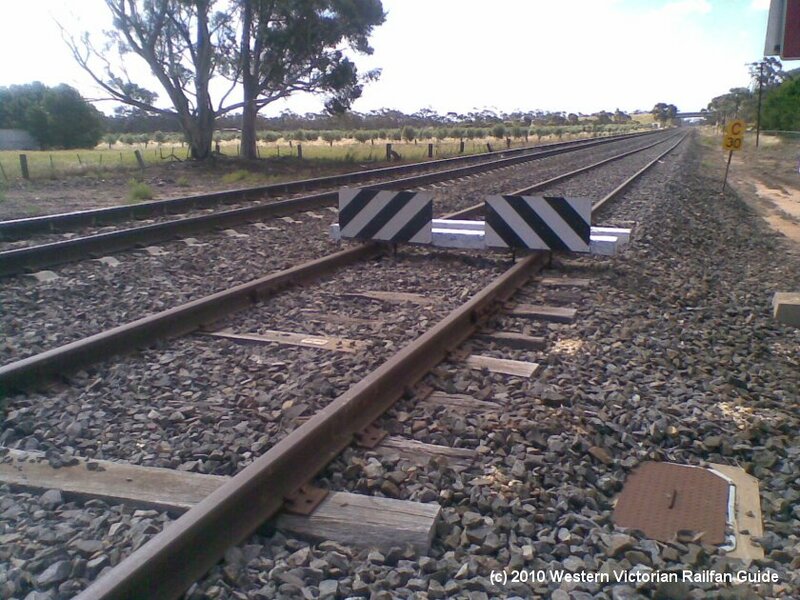 It was noted today (Fri.17.12.10) that baulks have been placed over the Dimboola to Yaapeet line just to the down side of the Cemetary Road level crossing.